Birmingham Intermodal is a multi-building transportation hub linking Amtrak, Greyhound, Megabus, municipal bus (MAX), bicycles, ride-sharing, and pedestrians on 3 blocks in downtown Birmingham, Alabama. Located in the heart of Birmingham’s City Center District, it provides convenient transportation alternatives for citizens and serves as a welcoming gateway for visitors. Accommodations for bus rapid transit (BRT) and high-speed rail are planned for future phases. The Intermodal Facility consists of 2 new buildings and limited surface parking. 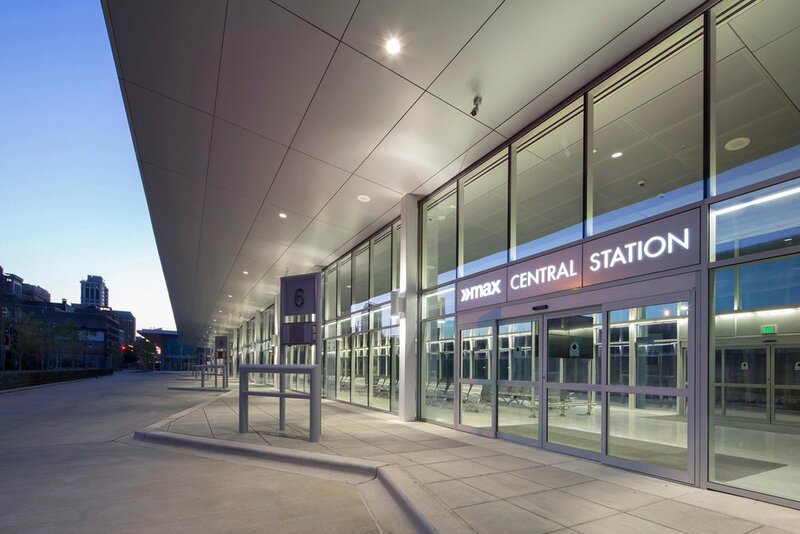 The 2-story, 49,059 SF, “Birmingham Intermodal” building houses shared passenger amenities and operations for Amtrak and Greyhound, administrative offices for Birmingham-Jefferson County Transit Authority, a police substation, and tenant space for a smart vending store. 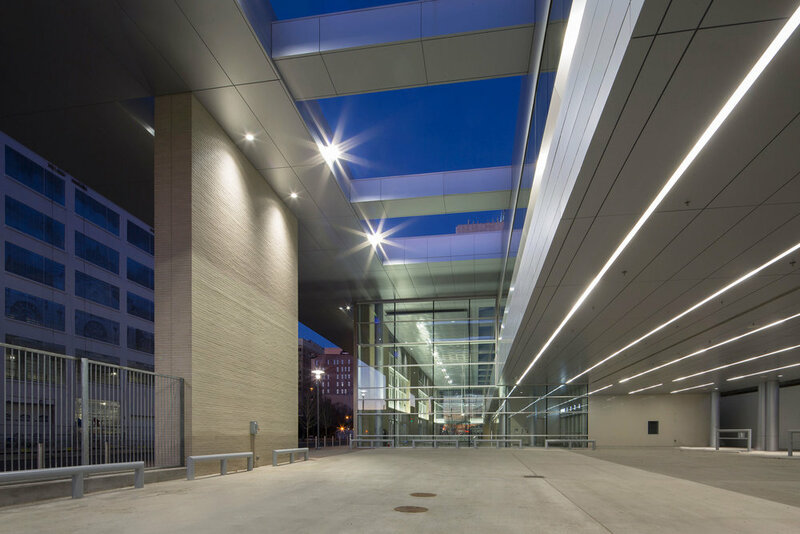 The adjacent 39,630 SF “MAX Central Station” building accommodates shared passenger amenities, operations and a drivers’ break room for the MAX bus system. A welcoming, contemporary, architectural design conveys permanence and a responsible use of public funds. The exterior forms take a decidedly civic stance, anchoring the project in a way that transcends its 3-block site. A simple and elegant material palette of brick, glass, metal panels, terrazzo, and tile, defines the architectural character. The contemporary design approach reflects Birmingham’s forward-thinking citizenry and leadership that are embracing their transportation future. NBA partnered with Giattina Aycock Architecture Studio of Birmingham on the design. The owner desired to create a unique upscale “sense of place” in a progressive urban city in transition that is known for dairies, railroads and military influences. The project aspires to be a cornerstone in the heart of a revitalized industrial area, speaking to Chamblee’s diverse history and resident mix. Targeting entrepreneurs, the development aims to provide a fresh perspective to a predominately transit area lacking space for small business owners, creating a true live-work-play atmosphere. 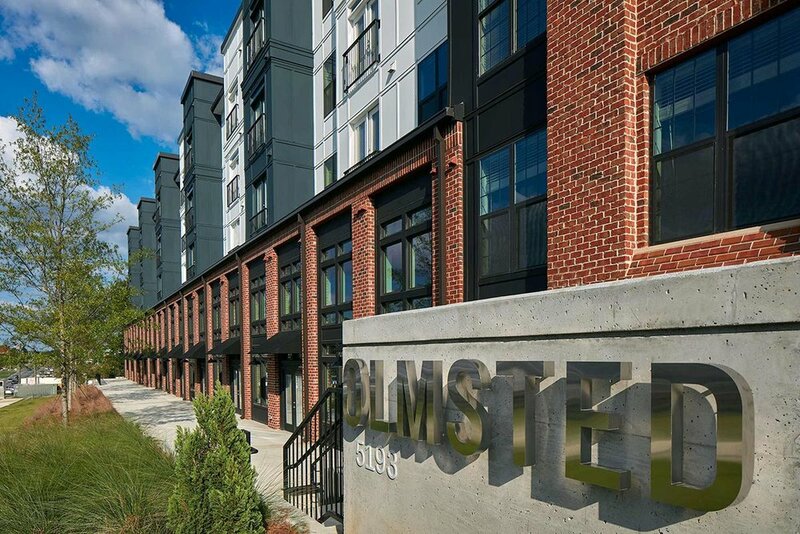 Olmsted Chamblee stands apart from its peers because of its eclectic and curated interior design and the architectural vision that created a collection of buildings over its 1,000 linear feet of street frontage. By not settling for an a monolithic, homogeneous block, multiple buildings with distinct identities form a kind of urbanism that delights, surprises, and encourages local residents to recognize a sense of place. The 37’ wide rooftop “CHAMBLEE” sign at the highly trafficked corner of Peachtree (Industrial) Blvd and Chamblee Tucker Rd. is this urbanism’s exclamation point and its megaphone for the city at large. Located within walking distance to the Chamblee MARTA station, Olmsted’s location reiterates the importance of infill redevelopment and the value of proximity to transit. With direct access to Keswick Park and a connection to Brookhaven’s Blackburn Park (currently under construction), the site provides multiple transportation and recreation options. Olmsted was at the frontier of the Chamblee market, being the first major development this cycle, which has since sparked a building boom that continues today and includes residential, senior, medical, mixed-use, office, and retail developments throughout the area. The project team overcame difficult zoning and building code standards that challenged the proposed wood construction and has successfully demonstrated that a high-quality product can be achieved in this medium.